Remove all the feathers. Cut off neck. Cut off head from neck. Cut off legs at knees. Extract entrails and rub skin with salt to clean inside and out. Wash well with water. Remove the wings and the thighs with the legs. Chop the legs off at the thighs. Chop the breast in half lengthwise and each half widthwise. In a pot put the garlic, savory, galantine, hyssop, sage, parsley and wine. Add the curlew except the head, claws and entrails. Cover with water. Bring to a boil. Reduce the heat and gently boil for one hour until tender. When almost done, remove the onion. Chop in a food processor with one cube of bullion and enough liquid to mash well. Place in a saucepan and slowly add flour, stirring continually. When the flour is dissolved slowly add 1 c broth. Heat until the substance thickens like gravy. Place enough olive oil in a metal measuring cup to swirl around and coat the sides. Discard the excess. This way after measuring the honey, it will not stick to the measuring cup. Pour the honey into the gravy and stir until mixed. 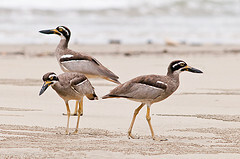 Pour the sauce over the curlew and serve. 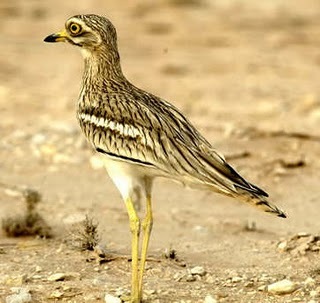 *Chances of having to cook a stone curlew are few as it is an endangered species today. Also as it feeds on fish, like the solan goose (see alcatraz), the meat has a fishy taste. It is perfectly all right to try this recipe with other fowl.